In a world of increasing financial risks, awareness issues and policies have become critically important. Acknowledging the importance of better financial education and literacy for improving the ability of people to use financial services; to make effective decisions with respect to their present and future welfare; and in order to respond to growing concerns over adverse affects of low financial literacy levels; a comprehensive and high-level project on financial literacy has been developed. 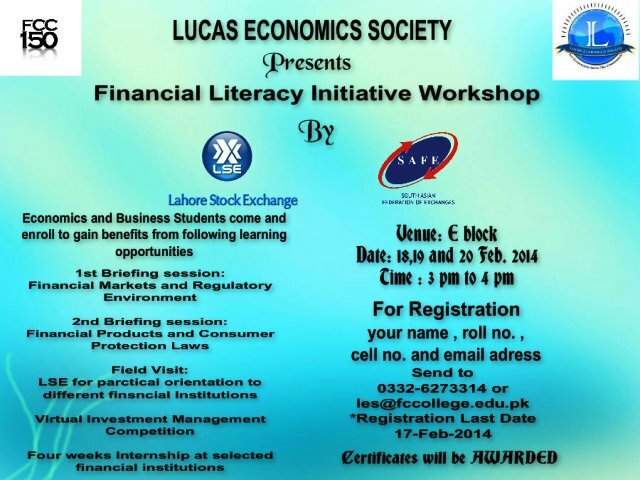 For the acknowledgement of this important issue we are going to organize a three-day workshop on Financial Literacy Initiative to be held on 18,19 and 20 February 2014 for FCC students. This workshop will allow students to make their future secure but could also be helpful in improving the condition of our economy and in getting jobs.